Secretary General for Tourism Policy and Development Georgios Tziallas, ISA President George Patoulis and Greece’s General Consul in LA Grigoris Karachalios. 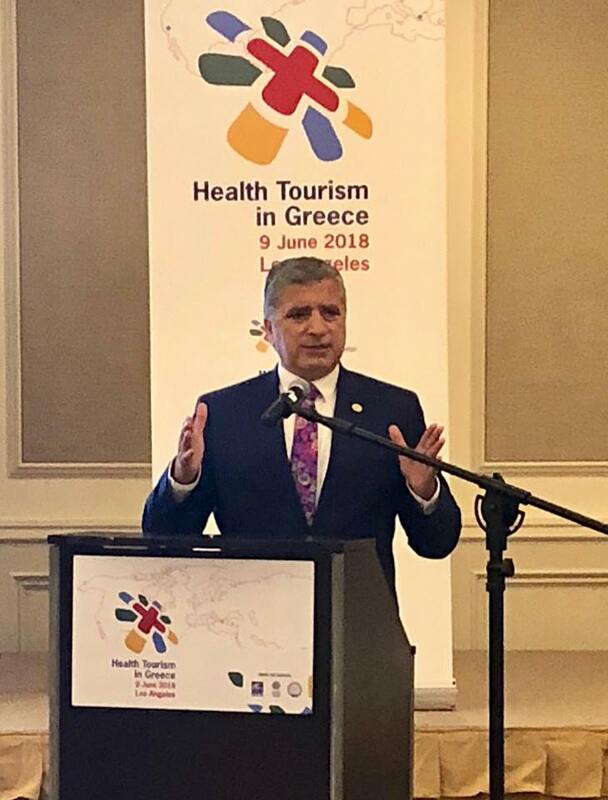 Greece’s potential as a leading health tourism destination offering high quality services at competitive rates combined with fine accommodation and holiday options, was the focus of a day event held at the Huffington Center in Los Angeles, over the weekend. “We are strengthening the country’s outwardness and we are working to expand growth prospects and fortify local communities with health tourism as a vehicle,” said ISA President George Patoulis addressing the workshop, which was organized by the International Health Tourism Center and the World Institute of Greek Doctors under the auspices of the Athens Medical Association (ISA) and the Central Union of Municipalities of Greece (KEDE). According to data presented at the workshop, health care spending in Greece is 60 to 90 percent lower compared to that at rival destinations with shorter waiting periods. Patoulis went on to note that besides introducing markets to the medical services options available in Greece, emphasis should be placed on tapping into the country’s vast potential as a spa tourism destination, which will benefit from 25 million euros in funds already set aside for this purpose. “Until now, 60 thermal spring locations have been recognized and certified in the country, with others currently under consideration,” said Secretary General for Tourism Policy and Development Georgios Tziallas, adding that “medical tourism, healing and wellness tourism will be further promoted by the tourism and health ministries, spurring private initiative to develop this valuable form of tourism for the economy”. The LA event is the sixth in a series following similar workshops in New York, Chicago, Melbourne, Montreal and Sydney. Speakers included academics, sector professionals, medical services and wellness representatives, IVF experts from the Ygeia Group, Elitour, Capsis Hotels and others. The next event will take place on the island of Kos, which will host an International Medical Tourism conference on June 23-24.